This is the first game in the Ogre Battle series. For other games in the series see the Ogre Battle category. Ogre Battle: The March of the Black Queen (伝説のオウガバトル, Densetsu no Ouga Batoru?, Legendary Ogre Battle) is a strategy game with RPG elements that was originally released for Nintendo's Super Nintendo. It was directed by Yasumi Matsuno with artwork by Akihiko Yoshida and is the first installment of an episodic series (although it is supposed to be the fifth episode, the previous episodes had been unproduced so far), and was originally developed by Quest for the Super Famicom system (and subsequently Sega Saturn in 1996 with vocal acting) in Japan. Enix of America only distributed twenty-five thousand copies of the Super Nintendo version to the United States, which made it one of the rarest critically acclaimed video game titles to date. As such, it can be difficult to purchase a copy of the game, which can sell for over 30% of its original retail price. 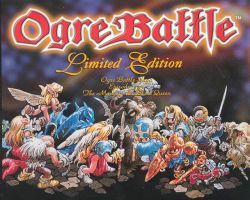 It was rereleased by Atlus as a PlayStation game (along with Tactics Ogre: Let us Cling Together) in 1997 with the name of Ogre Battle: Limited Edition. The version of the game is not as difficult to procure as the original SNES cartridge. Ogre Battle mixes movement elements of a real time strategy game with the character development and combat of a RPG. The game consists of a series of battles where you deploy units to fight against enemies and liberate occupied towns and temples. Each stage has a boss whose defeat signals the end of the stage. Both during and after the stage, towns and temples can be visited to gain information or items. The game also features an alignment system, both for the revolution as a whole (reputation) and for individual characters (alignment and charisma). These parameters are influenced by how the game is played. In the outskirts of the Zeteginan Empire, twenty-four years after the founding of the empire, you are chosen to lead a revolution against this empire which has turned to evil through the use of black magic by the mage Rashidi. This page was last edited on 25 September 2015, at 01:04.